Traditionally, the Prinsesstårta is green, and as much I loved the traditional colouring and had originally wanted to stick with it, I felt the occasion called for a more muted, elegant colour set. So I coloured the marzipan brown and opted for white roses with a pink centre, rather than the bright pink. IO adorned it with a green ribbon to hark back to the traditional version. I tried to get a bit more realism in the roses this time, despite still lacking the veiners to get the proper texture. I used piping gel to create little dew droplets on the flowers and the leaves. when I took the cake over to my partner’s place, a few people pointed out the little droplets. It’s wonderful when you add tiny, almost insignificant details and they get noticed. Rather than the single rose usually adoring the cake, I added a couple of little rosebuds around the sides. 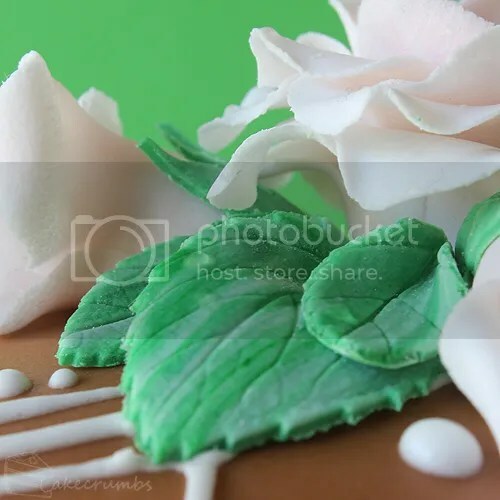 I was going to go with realistic leaves, too, but as I was colouring the fondant I decided to stop half way and use the interesting marbled patterns that had formed in it. And then to the top, I piped some royal icing decorations. They turned out a little haphazard since I didn't really know what I was going for. But considering how terrible I am at piping, and how disastrous previous attempts have been, it was nice to get a little control over the medium. The trick is all in getting the right consistency. It made such a difference, to the point I was able to make such teeny dots. But inside is where the party was at. The sponge was so dellicate and soft my usual string layering technique threatened to crumble it to pieces. I whipped out the serrated knife for the layering cause this baby is the lightest, fluffiest sponge you'll ever see. The first two layers are filled with jam and custard. The next two are filled with custard and whipped cream: the latter part is built to give that dome shape. The cake reminded me of those beautiful classic sponges you're used to, just arranged differently. It was definitely a lovely experience and everyone loved it. This cake is best eaten on the day it is made. If you're planning this for an occasion you can make it the day before (allowing time for the flavours to mature makes for a great tasting cake), but try to cover it with the marzipan the day of consumption. Rolled icing will go limp in the fridge, and likely sweat when removed from the fridge (especially if it’s not winter like it is here – our cold weather made it a little more forgiving). If you're concerned about aesthetics, you'll want to cover it as close to the time of serving as possible. Preheat oven to 180­°C (350°F). If you have a fan-forced oven, turn the fan off. Grease or line a 23cm round springform tin with baking paper. Beat eggs and sugar together on medium speed until the eggs are light, fluffy, have tripled in volume and fall from the beater in thick ribbons. This will take about 5 minutes. Take care to not overbeat the eggs. Sift the flour, cornflour, baking powder and salt together in a separate bowl, then sift it again over the whipped eggs. Gently fold in the flour until just combined (take care not to lose the air you've just spent 5 minutes beating into the eggs). Pour batter into prepared tin. Bake in the lower third of your oven for 40 minutes, or until golden brown on top. You may test with a toothpick, but note that the cake should stay moist and the toothpick will emerge with crumbs sticking to it. Once cooled, cut cake into three even layers. In a medium bowl, whisk the cornflour, sugar and egg yolks until combined; gradually whisk in the 120ml of cream until smooth. Heat the remaining 120ml cream and vanilla pod in a small saucepan over medium heat, stirring continuously. When mixture just boils, remove from heat and pass mixture through a fine mesh sieve. Slowly, pour the hot cream into the bowl with the egg mixture, whisking continuously. Pour the custard into a clean bowl; cover with plastic wrap and chill in the fridge until ready to use. In a medium bowl, whip cream to stiff peaks. You may flavour with a little vanilla essence and sweeten with a pinch of caster sugar if desired. 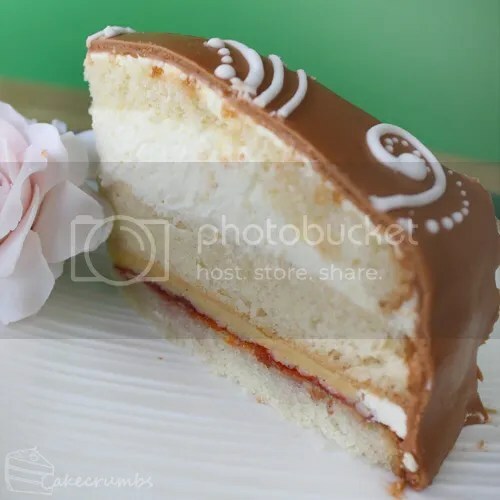 Arrange the bottom layer of sponge on a cake board or serving platter. Heat jam in a small saucepan over medium heat until mixture begins to boil. Pass through a fine mesh sieve to remove seeds, then spread over the sponge layer. Spread with half of the custard, taking care to not let the custard spill over the edges. 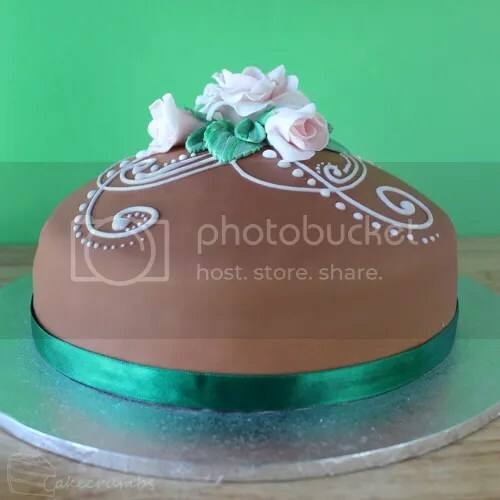 Reserve the middle layer of the sponge cake for the dome, as this layer doesn't have a crust and as such is more flexible. Instead, place the top layer of your sponge cake on top of the jam and custard. Spread the rest of the custard onto this layer. Reserve about 120g of the whipped cream. Dump the rest on top of the custard, then spread to form a smooth dome. Place the final layer of sponge cake on top, then tuck the edges down around the sides of the cream dome. Take care not to press down on the centre of your sponge – you don't want to flatten the dome or make the cream squirt out the sides. With the remaining cream, spread it over the rest of your cake and smooth it out to form a smooth crumb coat over the entire cake. Refrigerate for at least an hour before continuing. Dust your work surface and a rolling pin lightly with corn flour: then roll out your marzipan as thin as you dare to go — I like to make it a few millimetres thick. The width you roll it to is most important: ensure it's wide enough to cover your cake. Be sure to continually shift the marzipan on your work surface as you're rolling it out, or it may stick to the bench. If you need to, dust underneath it with more cornflour as you go. Once rolled out, use a rolling pin or your forearms to gently lift the marzipan onto the cake. Use your palms of your hands (never your fingertips) and, beginning in the centre of the dome, gently rub the marzipan to secure it in place. Work your way to the edges of the cake. When you reach the sides, you'll have to keep pulling the marzipan away from the cake to ensure you don't make creases in the marzipan. Keep lifting and smoothing the marzipan with your palms until the entire cake is covered. Trim away the excess marzipan at the bottom. 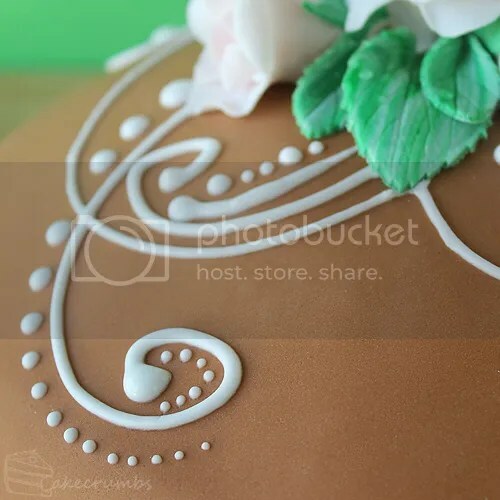 You can use royal icing or melted chocolate to pipe decorations, or simple dust with icing sugar. Adorn with marzipan roses and leaves. Serve. This post was a wonderful read. 🙂 I’m off baking at the moment (forced, by an injury to my elbow), so it was lovely to read of your efforts! Your decorations look fantastic! 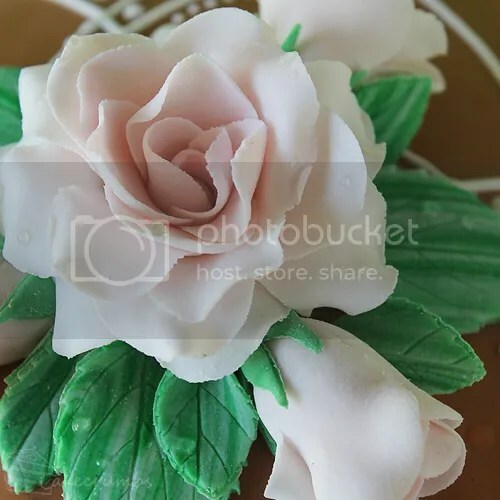 A question: do you make the fondant flowers on the same day as you make/decorate the cake, or in advance? If the latter, how many days in advance would you make them? I am sorry to hear you’re injured! I hope you have a speedy recovery! It sounds like they very well could be related! It depends on my schedule. I usually make them at least a day in advance. Ideally you’re supposed to let the inner petal dry before adding the outer but eh – it’s cold enough here at the moment that it doesn’t matter much. They can basically be made whenever you have time, but I would only put them on the cake soon before serving. The fridge makes them go limp. Your cake is a work of art. I love everything about it but it is really the water drops that took my breath away. Oh, I can’t wait to try this out. It looks so beautiful and I just love Princesstårta! WOW! That takes some skills! 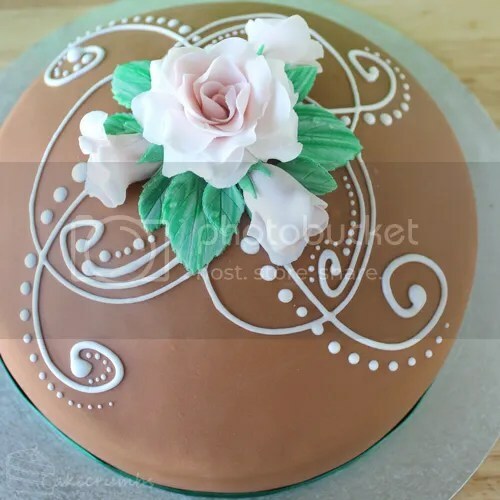 From the flawless flowers to the piped pattern and the smooth marzipan it’s just perfect. Your decoration is so beautiful. I’m really amazed! Fantastic job! Your princess cake is utterly gorgeous!! I love how sophisticated and beautiful it is! And amazing job on the roses, leaves and piping!! 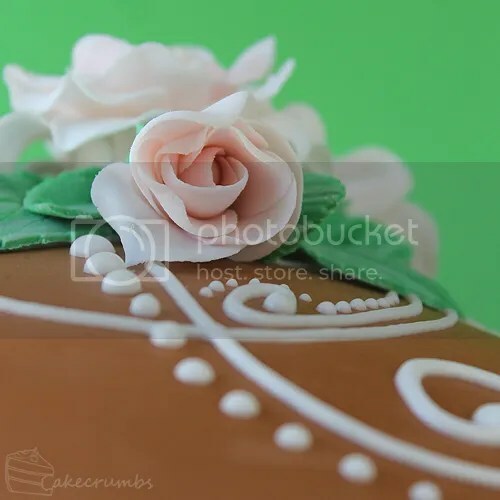 OMG, I love everything on that cake, from those pretty royal icing haphazard design to those unreal roses. Bravo! What a beautiful torte you did. The colors you chose are perfect and your roses are so realistic. Well done indeed! This cake is so beautiful. Love the way you have decorated it. And the roses looks so real! A stunning cake. You never fail to impress with your creations. We all loved the cake – looks so elegant, decorative and was very yummy. I’ve been looking through your blog and I’d say you are an artist as much as a baker! I’m truly impressed! It got me wondering, have you ever tried another Swedish tradition, namely gingerbread houses? I think you’d love it. That’s a piece of baking that is as much an art as it is cooking, and the possibilities are endless! (me and my sis did the space shuttle Discovery once, to celebrate the first swedish astronaut in space). Good luck with your baking! If every Prinsesstårta looked like that, I think I would be happier. 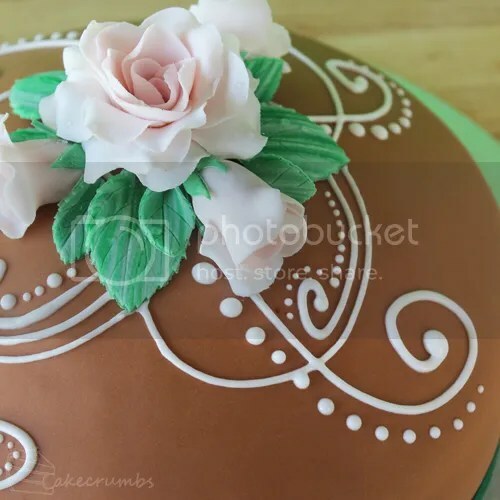 If you live in Sweden, 80-90% of birthday cakes are prinsesstårtor, it gets boring with all the green marzipan and wipped cream. Yours is stunning! Thanks so much. I felt really bad about moving away from the traditional colours so that’s lovely to hear! Please where can I buy glucose and glycine in sweden? As I do not live in Sweden I cannot help you. If they are not in your local supermarket you can try speciality food stores or cake decorating stores.